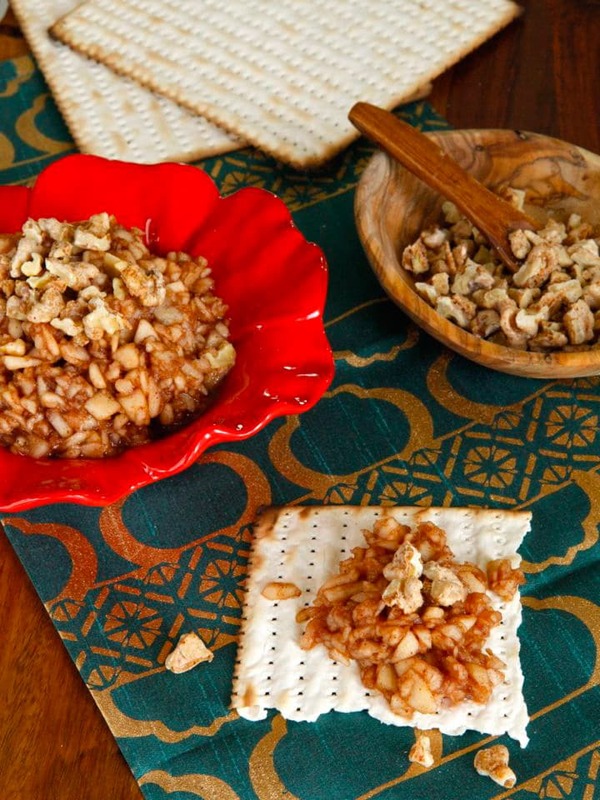 Charoset is a fruit and nut mixture that is used as a blessing for the Passover Seder. The texture of charoset symbolizes the mortar used by the ancient Israelite slaves of Egypt when they toiled under the rule of Pharaoh. 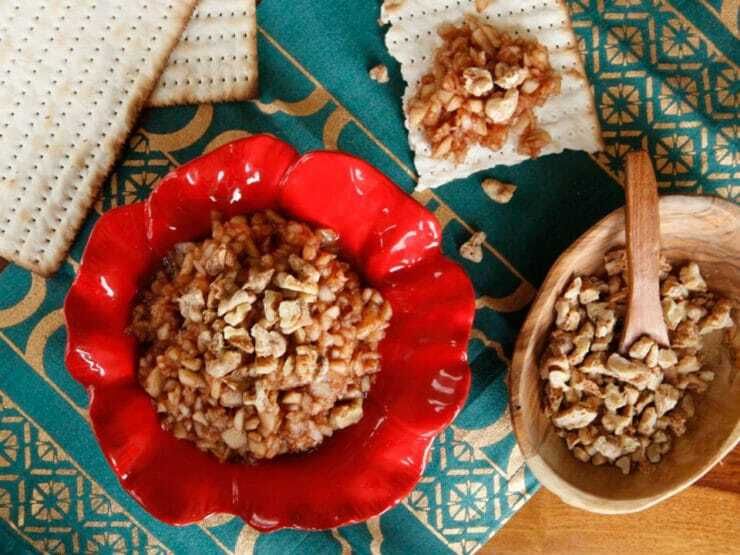 Most Jews have a soft spot for charoset; eating it signifies the end of the long Haggadah blessings and the beginning of the Seder feast. In our home, we make extra charoset for the Seder and nosh on it all week! My family’s charoset recipe is pureed to a paste before serving, Sephardic-style. Many of my Seder guests prefer the chunkier Ashkenazi style, so over the years I have created my own version. 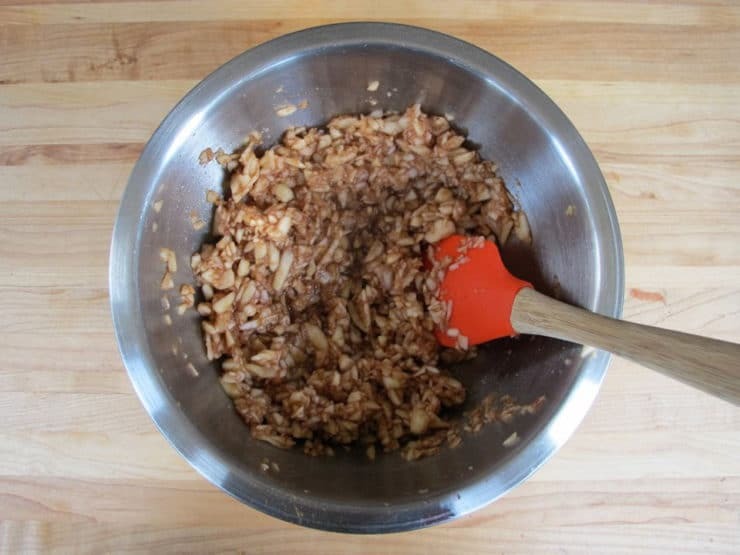 Most Ashkenazi charoset recipes are pretty simple, a mix of apples, sweet kosher wine, walnuts and spices. Of course I wanted to create my own spin on this concept. I developed a basic apple charoset, heavy on cinnamon and spice, sweetened with wine and honey. Then, rather than integrating walnuts into the charoset, I candied them with cayenne for a crunchy finish with a kick of spice. The walnuts here are served as a topping to the charoset; you shouldn’t mix them in or they’ll lose their delicious candied crunch. This charoset can be made ahead– in fact, I encourage you to marinate it overnight before serving to improve the flavor. 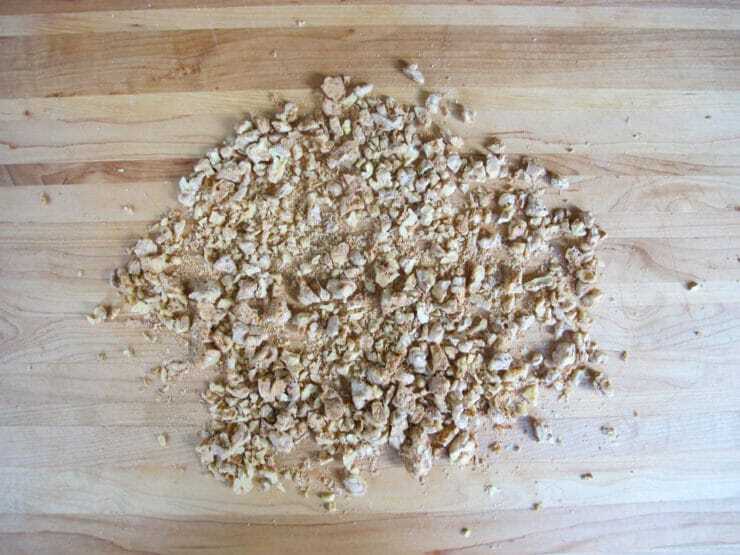 The nuts can also be candied ahead of time and stored separately from the charoset. Sprinkle on the candied nuts just before you put it on the table, or serve the nuts alongside the charoset and allow people to sprinkle their own onto each serving. Peel and core the apples, then chop them fine. 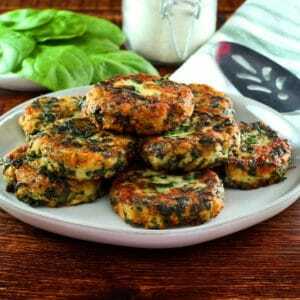 I usually put them in a food processor and pulse a few times till they're chopped fine but with texture. Careful, it's easy to over-chop if you go this route and you could end up with applesauce! Place the chopped apples in a bowl. Stir in 5 tbsp sweet kosher wine, honey, cinnamon, ginger, allspice and a pinch of salt (to taste). Taste the mixture; if you feel it needs more moisture or sweetness, add a bit more kosher wine. The wine will be soaked up a bit as the charoset marinates, but you don't want it puddling too much at the bottom of the bowl... a little puddling is fine. Preheat oven to 300 degrees F. Separate egg white from yolk, then pour half of the egg white into a mixing bowl (just eyeball this, it doesn't half to be exact). Use a whisk to beat the egg white till frothy, then beat in the sugar, salt, cayenne, cinnamon and nutmeg. Add the walnuts to the egg mixture and stir till the walnuts are fully coated in the seasoned egg white mixture. 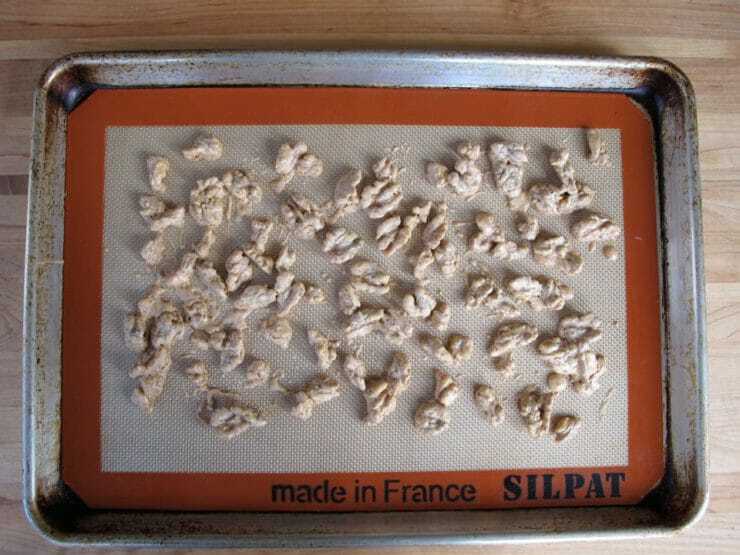 Spread the walnuts out on a baking sheet lined with parchment or a silpat. Bake for 15-20 minutes till crisp. Remove sheet from the oven and allow the nuts to cool on the sheet. Sprinkle on the candied nuts just before you put it on the table, or serve the nuts alongside the charoset and allow people to sprinkle their own onto each serving. The walnuts here are served as a topping to the charoset; you shouldn't mix them in or they'll lose their delicious candied crunch. I love this charoset! I up the spices a bit because I love them so much. I also don’t peel my apples because I like the skin and I think the color really adds something (yes, I know, it’s supposed to be brown because it symbolizes mud…oh well, I like the skin!!). Yummy! Thanks for the recipe! I will be adding orange zest as well. Thanks for all your suggestions-and you are just so gracious in all of your responses 🙂 Chag Sameach! I was wondering if you have a recipe for stuffing for passover. I can’t seem to find one on your website and I love your recipes! Please let me know. one stalk of celery cut into desired sized pieces, one vidalia onion cut into desired sized pieces. Combine both ingredients in a large bowl. Add 8oz of concentrated chicken soup and 1 1/4 cups of hot water. Sprinkle 1 teaspoon of salt and 1/4 teaspoon of pepper over the mixture. Mix in 4 cups of matzo farfel and 4 eggs. Bake the whole mixture in a greased large pyrex dish at 350 degrees for about 45 minutes covered, a crispy top can be made by uncovering the dish. Feel free to experiment with different combinations of fruits and nuts to complement your meat and chicken recipes. Lastly, cut into squares for serving and enjoy this tasty and festive addition to your passover meal. 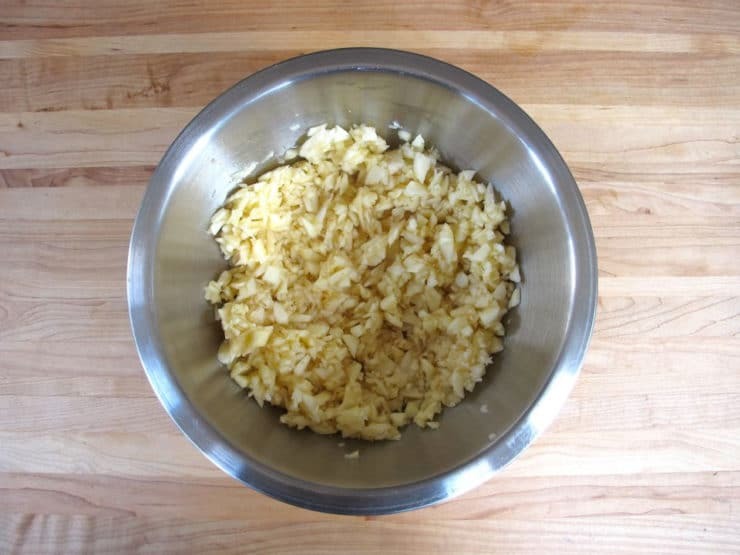 Do you use fresh ginger or ground ginger from a spice jar? Didn’t have time to do it ahead, I’m making it about 4 hours ahead of Seder. Hope it will be ok.
do you have a recipe for the regular old fashioned haroset? I keep the family tradition alive and make the charoses like my grandfather showed me.I carefully choose just the right apple, chop it with walnuts, add the sweet kosher wine and cinnamon. That’s it. I hope my children and grandchildren continue the family traditions. The yummiest item on the Seder plate. Our charoset comes out like a kind of jam, delicious. Just raisins slacked in water, cooked. Blended and nuts added. Delish. Of Lebanese origin. We are having Seder with neighbors. For my contribution, I am making a Persian Charoses or Halleq, a Persian-style leg of lamb, and Israeli salad with crumbled feta. What kind of wine do you use Tori? When I see sweet kosher wine I think Mogen David. Nancy Mogen David works. Any kind of sweet red or concord wine will do. If you have strictly kosher guests coming to Seder, make sure the wine is kosher for Passover. 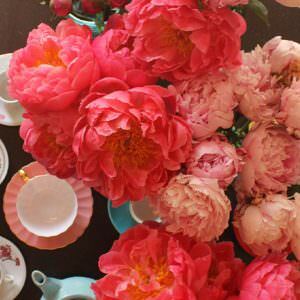 I use Mogen David and Honey. oh I LOVE this stuff !! A friend in Dallas always shared her special charoset made with cayenne for a Texas kick. Yummy! For sure going to make this. 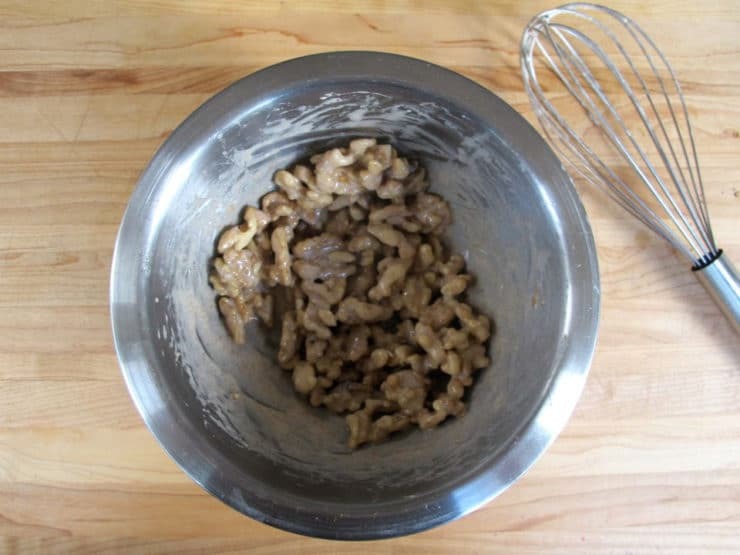 I love my charoset recipe but adding cayenne candied walnuts sound awesome. 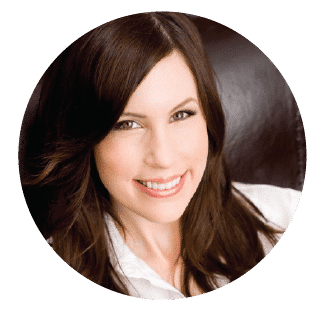 Love your website and all of the fabulous info and recipies! I am making a Sephardic Passover Seder this year and would love your families Charoset recipe. Where can I find it? Thanks and happy Passover! I second those emotions, Nancy S! My family is from Minsk and Pinsk (originally) and these recipes really take me back to when I was a little girl driving up to Chicago for Pesach with Bubbe! Happy Pesach, everyone! Thanks for this blog, Tori. Learn something new every day! I had not met a Haroset without apples. Anyway, mine is date based as well, and will be up on my blog next week! My family is from Syria.We don’t add apples to our haroseth,ours has dates,figs, prunes and raisins.This recipe looks delicious though maaybe I’ll try making two this year! We also use a Sephardic Haroset in our home (one of the few things that we specifically use a sephardic recipe!). I can’t wait to see your recipe. My next blog entry will be food based, so watch for it! Anyway, something interesting about Haroset. The Talmud give two reasons why we have Haroset on the seder plate. Zekher l’teet and Zekher L’tapuakh, in remembrance of the mortar and in remembrance of the apple. Remembrance of the mortar is obvious, as it is the reason everyone knows. 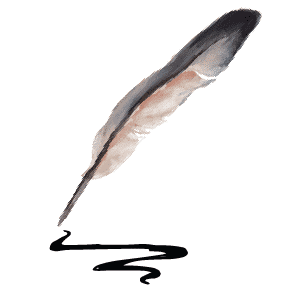 The Talmud tells a little story to explain the apple. The midrash tells us that when killing the children did not work, Pharaoh decreed that the men and women should be kept separate so that no more babies could be born. But during the heat of the day, when the people would rest from work, the women would go under the apple trees and entice their husbands to lie with them. The midrash then tells us it is due to the efforts of the women that Jewish people survived slavery. So in remembrance of the apple, we have Haroset. Perhaps that is why ALL Haroset recipes have apples in them. Barb, let me know how it turns out for you! Thank you for this one! I like your spin on it, and I’ve been getting tired of mine the same every year. Fingers crossed!! !